This evening I didn't feel like an IPA, shock horror! But I also wasn't in the mood for a lager or a stout, hence tonight's beer choice. Apparently the name is short for Exceptional Pale Ale, hopefully it can live up to its name! 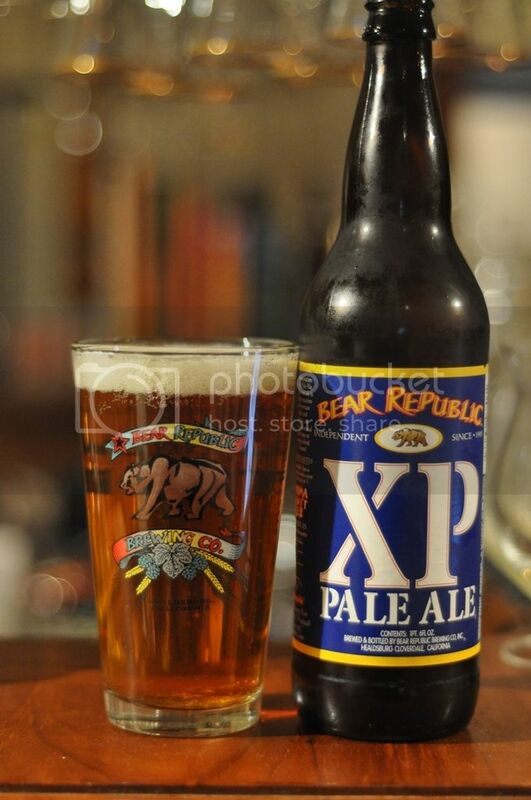 I've had Bear Republic stuff in the past but when I was down at a beer shop the other day I saw this one, XP Pale Ale. I hadn't heard of this particular one before, but the American guy in the shop sold it to me by saying that it is a better pale ale than Sierra Nevada's. I hope he's right! XP Pale Ale pours a light golden colour with very little in the way of head. The head has bubbles throughout and is an off white colour. What the head lacks in size it makes up in retention and lacing qualities, it's simply superb! The entire glass is coated in lacing by the time you have finished drinking, while for the entirety of consumption there is a thick layer of foam across the surface of the beer. It's an exceptional looking beer! It's a bit different to what I was expecting. There is nowhere near as much bitterness as I expected as this beer starts with a citrus tang. There are some pine hops present, while a bready malt backbone really holds the beer together. It's an incredibly easy drinking pale ale and the 650ml bottle disappears very very quickly! A really impressive pale ale. Bear Republic really have delivered an Exceptional Pale Ale (pardon the pun)! This is right up there with the best examples of the style due to the superb drinkability. Sometimes APA's become slightly too sweet and almost cloying, but this one, despite a lack of real bitterness, doesn't even come near being considered a sweet beer. This is a beer I will be buying again for just this kind of night, when an IPA just won't quite cut it but you're not after something heavier. I would certainly recommend it!